Square Enix is showering its hilariously adorable PS4 title, World of Final Fantasy, with lots of love. 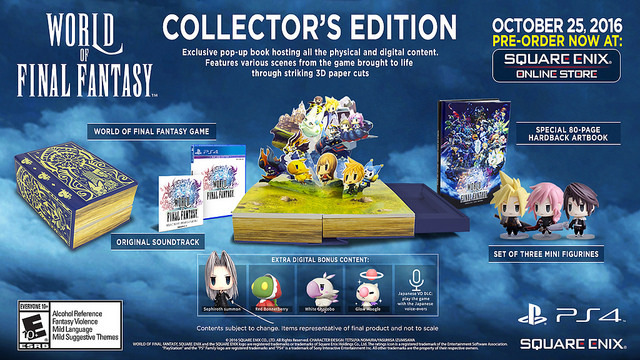 The chibi-style mashup of all things FF will hit shelves in the US on October 25 and for fans who are looking to go all-out on this unique game, Square Enix and Sony have you covered with this one-of-a-kind collector’s edition. And we even got a new trailer. This little set of Final Fantasy goodness will cost $120 which, as far as these things go, isn’t terrible and pales in comparison to Final Fantasy XV’s whopping $270 price tag. Assorted musings: when Square Enix announced this game last year, I thought it might be a throwaway money grab, but the more I see of its seemingly genuine adoration of Final Fantasy and its lighthearted but gorgeous visual style, the more it tugs at my heart.